OS X's built-in Sync Services framework lets applications synchronize certain kinds of data at the system level—things like contacts, calendar events, Safari bookmarks, and data from third-party programs like Bare Bones Software's Yojimbo ( ). Members of Apple's $100-per-year .Mac service (soon to be renamed MobileMe) can also sync this information between computers using .Mac Sync, configured in the .Mac pane of System Preferences. If you're not a .Mac member, though, or if you want to sync in ways .Mac doesn't permit, a one-time purchase of Mark/Space's $50 SyncTogether 1.0.2 may meet your needs. SyncTogether is designed to do essentially the same thing as .Mac Sync, using the same underlying technology and a similar user interface. But rather than relying on Apple's servers, it enables you to set up a network of your own Macs (each called a node) in which one functions as a server, mediating synchronization requests for the rest. After installing the software on each computer (a single license is good for three Macs), you choose a group name, designate one node in the group as a server and the others as clients, and set a few other basic parameters. You can then choose to sync each Mac manually or on a schedule (ranging from every 15 minutes to every week). In some cases, SyncTogether offers more granularity than .Mac Sync in the kinds of data you can sync. For example, instead of simply choosing whether or not to sync your contacts, calendars, and bookmarks, you can sync individual Address Book groups, iCal calendars, and Safari bookmark collections. In addition, you're free to sync data with other people (whereas .Mac can sync only with computers logged in under your member name), so you could share just one set of contacts with a family member and a certain calendar with coworkers, say. You can also sync between user accounts on a given Mac (each license covers any number of user accounts on a total of three Macs). 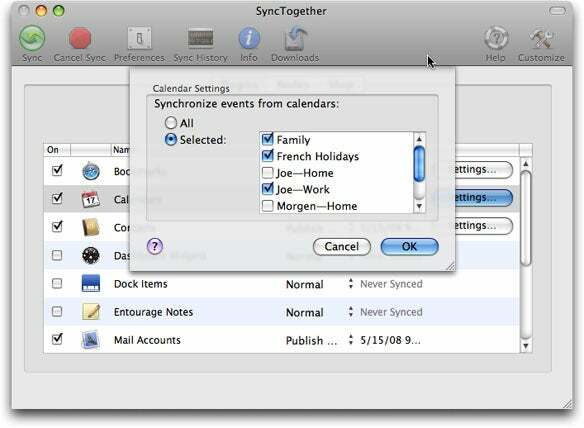 SyncTogether also lets you choose whether to synchronize the data (the default method), publish it only (make it available to other computers), or subscribe only to other computers' data (obtain published data); there are limits, however—you can't, for instance, publish only one particular calendar but subscribe to another on a given Mac. For every impressive feature, though, SyncTogether seems to present a frustration. For example, setup is complex enough when all your computers are on the same local network, but if one of them is in another location, you have to jump through several more hoops to sync it with the others. (Mark/Space considers remote syncing an advanced feature.) On the remote Mac, you must enter the IP address or domain name of the Mac that's functioning as a server; you might also have to fiddle with your home firewall, configure your router for port forwarding, and adjust several other settings on both Macs. Also, because remote syncing often requires changes to happen on both ends, it can be challenging to set up if you're already on the road with one of your Macs. The SyncTogether application must be running on each Mac for syncing to take place, but to ensure that this is the case, you must manually add it to your Login Items list, since each node may have different settings for automatic-syncing frequency. SyncTogether lets you selectively sync individual calendars, Address Book groups, and bookmark collections (among other kinds of data) between Macs. The Mark/Space Web site has a long list of other known issues, most of which involve limitations of Apple's Sync Services technology, or other constraints imposed by Apple. For instance, SyncTogether can't sync keychains or Chronos's SOHO Notes; it doesn't pick up Address Book groups automatically (though it leaves them in place if you've created them manually); and there are several situations in which two or more syncs must occur before certain data will be copied. Also, unlike with .Mac Sync, although you can reset sync history globally for a given Mac, you can't selectively reset synchronization for just one type of data in just one direction (say, overwriting all the calendar data on the server with data from your computer) in the event of data corruption; Mark/Space suggests frequent backups to deal with such situations. When SyncTogether 1.0.2 works, it generally works well. If .Mac Sync isn't an option for you, this program is far better than nothing. But its limitations and annoyances are not insignificant, and they multiply if you have more than a few Macs, especially if some of them are remote.